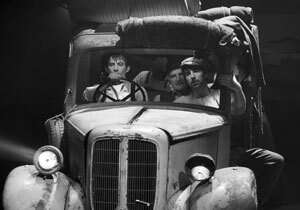 Staging a production based on John Steinbeck's classic novel of America's dispossessed in the Great Depression is ambitious for any theatre company. For the Citizens Community Company to take it on in the form of this adaptation by Tim Baker is beyond ambitious. Particularly so, when their sole professional performer, Citizens Actor Intern Mairi Phillips, is age/gender bound to play a relatively small but crucial role - leaving community cast members to carry the production squarely on their own shoulders. A great deal of that responsibility falls on Patricia Preston as the matriarch of the Joad family and she proves to be entirely convincing as a strong, driven woman, but one who knows her existence is hanging by a thread. Equally impressive is Chris McCann as her son Tom, with a well pitched balance between naive optimism and a determination to fight those contributing to their hardship. John McNeil provides strong support as emasculated Pa Joad while John Speirs makes former preacher Casy three dimensional instead of the plot device he could easily have become. Full time performer Phillips gives the Joad's pregnant daughter a beautifully light touch in her early scenes which makes her devastating final moments all the more effective. With an extended Joad family and an abundance of characters to encounter on the long journey from Oklahoma to California, there's plenty of opportunity for the ensemble making up a cast of almost forty to each have their moments to shine. But the acting is only half the story here, as the production makes fantastic use of song and on-stage musical accompaniment, managing to avoid scenes of vastly differing tones feeling in any way disjointed. In keeping with our approach of considering all performances we see to a professional standard, it would be remiss not to acknowledge that there were a few lines that we struggled to hear. However, the overall impression is one of an immensely slick and well drilled production. Co-Directors Neil Packham and Elly Goodman move the show along at pace and it rarely feels anything like its two and a half hour run time - with only an extended barn dance overstaying its welcome. Baker's adaptation makes the Joad's situation clearly relevant for both the current financial climate and the tensions that can arise from (im)migration. I did find it a little heavy handed at times in repeatedly hammering home its economics lesson but Waldorf happily accepted this as simply illustrating that the Joads just 'wouldn't be told' that California wasn't the land of milk and honey they had been cruelly lead to expect. Once again, the Citizens Community Company has delivered a high quality and relevant piece of theatre - we look forward to seeing what they have in store for us next.